Remember that time you knew exactly what to wear to a fall wedding? No? Well now you will! Wedding season is pretty much year round, which means we always need to know what to wear. Having a couple of go-to options in your closet for a fall wedding is as simple as having a few pieces that can work for a company party, a dressy outing with friends or – that last minute wedding you were invited to. Enjoy these outfit ideas for a fall wedding, shop a few pieces and be ready to get dolled up for that event in no time. 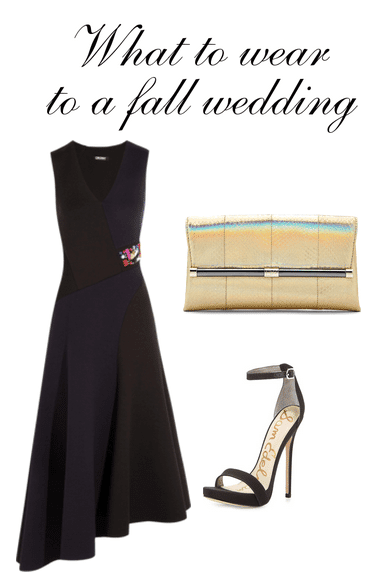 Can you wear black to a wedding? Yes, yes you can. Black has become a go-to shade for wedding guests and even bridesmaids. The rules have changed, which makes shopping for that perfect dress so much easier. Plus, a black dress can be worn to numerous events, making it a worthwhile investment. I have a black bridesmaid dress hanging in my closet that has been worn by myself since the wedding, has been worn by my daughter (she was Audrey Hepburn for Halloween) and has been borrowed by a friend for a wedding. Black is a go. Here are a few wedding guest dress ideas. Look stylish at the wedding with a clutch to hold those necessities such as credit cards, i.d. and lip gloss for touch ups. You can go understated with a black clutch or bold and bright with a gold one. It’s up to you and either one is acceptable to carry at a wedding. Even a small crossbody, that can be worn over the shoulder would be perfect. Some crossbody bags have removable straps which allow you to use it as a clutch. I like to invest in pieces like that, because they’re so versatile. Next articleWe Celebrated World Pasta Month at Buca di Beppo!